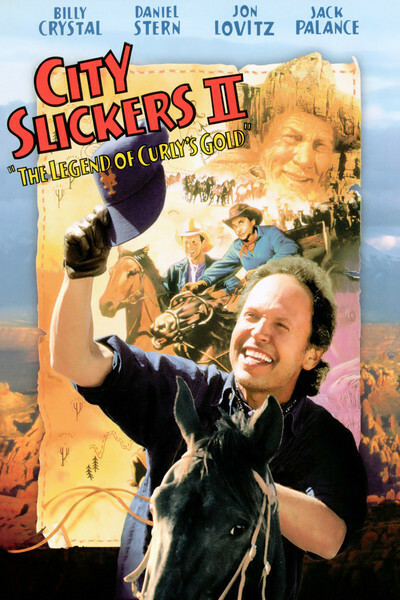 "City Slickers II," subtitled "The Legend of Curly's Gold," makes the mistake of thinking we care more about the gold than about the city slickers. Like too many sequels, it has forgotten what the first film was really about. "Slickers II" is about the MacGuffin instead of the characters. You remember MacGuffins. The term was coined by Alfred Hitchcock, to describe whatever it is that everybody in a movie seems to care deeply about. What Hitchcock understood was that it didn't matter what the MacGuffin was. It could be a spy ring, a secret formula, a treasure map - or Curly's gold. No matter what the MacGuffin is, a movie works or doesn't work on the basis of its characters and their human story. The original "City Slickers" (1991) knew that. It told the stories of two men (Billy Crystal and Daniel Stern) who were locked in gloom, and a third (Bruno Kirby) who convinced them to go to a dude ranch where they would rediscover themselves. Crystal's wife agreed, urging him to "find your smile" again. And then, as the three men joined other urban refugees on the ranch, they fell under the spell of the grizzled old trail boss, Curly (Jack Palance, in an Oscar-winning performance). The movie was a comedy, yes, but it was also rich in human values, and in their talks around the campfire the men confided secrets and worries that we could identify with. The movie was so special that Crystal said he didn't want to do a sequel until he had exactly the right screenplay. He should have waited longer. "City Slickers II" begins with the enigma of how to handle Curly's death in the first picture. Since the character of Curly is the cornerstone of the entire Slickers universe, it was obviously necessary that he return, in one way or another, from the grave. "Slickers II" solves that problem neatly by providing Curly with a twin brother, played by Palance as more or less exactly the same character. (It might have been amusing to make the twin Curly's temperamental opposite - but never mind.) The plot involves a treasure map left behind by Curly. It points the way to a long-lost gold mine, and to a recycled version of "The Treasure of the Sierra Madre," in which three prospectors venture into the dangerous hills in search of wealth. The Kirby character has dropped out this time, replaced by a brother of the Crystal character, played by Jon Lovitz. Together with Curly's twin, they go looking for the gold. Before long, the three men actually begin to develop into alarming imitations of action heroes - which is contrary to the whole spirit of the original premise. It was here that my attention began to drift. I didn't care about the gold, and, having seen "The Treasure of the Sierra Madre" again recently, I didn't need a pale imitation. What I missed was the rich humor and the human comedy of the original film - where the people, not the plot, were what mattered. By the end of the film, with "Slickers II" also borrowing from the Indiana Jones movies, I was overcome with deja vu and indifference. It is a lesson easily said, but learned with difficulty, that in a good movie the plot should be at the service of the characters, and not the other way around. Hitchcock knew it. So did old John Huston, whose "Treasure of the Sierra Madre" was not about three prospectors growing rich, but about three men who discover that gold cannot buy them their dreams.